We wedged this into the machine shop schedule today. Had a bit of free time on the Haas Lathe. Not sure where we are headed with the logos yet but the caps fit. They have an o-ring retainer. Should minimum have a Viggen Logo for customers, My car will most likely have my script name. Going to try some epoxy based color inlays too. I am sure there are others out there tired of the broken tabs on the plastic BBS caps. This entry was posted on Thursday, August 25th, 2011 at 2.12 pm and is filed under (Nicks) Viggen, CNC / R&D Parts. You can follow any responses to this entry through the RSS 2.0 feed. You can leave a response, or trackback from your own site. Any chance you’ll be making these in different diameters for non-BBS wheels? With a Griffin-head? Maybe in titanium to prevent road salt corrosion (one can hope)? Sure some $200 Titanium wheel caps. 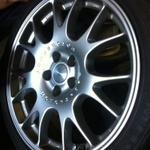 Nick, will these fit the 17″ Saab BBS RKI/II rims? My center caps are delaminating and replacements are hard to find. We have the Large BBS/Saab caps in stock for those. These are the smaller caps.